The Hindu Calendar is based around the lunar cycle. The reference point, which is used as the starting point of the most widely used calendar, is the coronation year of King Vikram. Each year is divided into 12 equal months comprising of 30 days. Each month is further divided into two equal halves. The first half (sud) is referred to as the bright half and this corresponds to the 15 days from when there is a new moon to when a full moon is visible (poonam), i.e. when the moon is waxing. The dark half (vad) refers to when the moon is waning, i.e. the 15 days from the full moon to when there is none (amaas). At Shree Swaminarayan Gadi, this amaas day is referred to as Shree Sadguru Din. Each Sadguru Din is held with great significance as it commemorates the life and works of Sadguru Shree Ishwar Bapa, who left his mortal appearance on the day of amaas. Adya Acharya Pravar Shree Muktajeevan Swamibapa began the observance of Shree Sadguru Din on Vikram samvat 2006, Jeth vad amaas, (1949). Each Sadguru Din comprises of multiple dhyaan (meditation), dhoon (chanting), kathaa vaartaa (religious discourses and discussions) and kirtan bhakti (devotional singing) sessions. Sadguru Bapa and Jeevanpran Shree Abji Bapashree were particularly fond of these modes of worship and so it is these that are given a prominence on Sadguru Din. 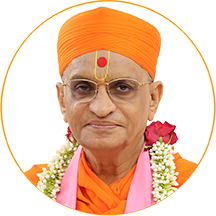 Jeevanpran Swamibapa says that Sadguru Din should be used as a barometer for one's own self-assessment of how much progression has been made during the previous month, in the devotion unto the Supreme Lord Swaminarayan. In the Vachnamrit, Lord Swaminarayan gives the example of a businessman. A wise entrepreneur will regularly and frequently keep a check of his accounts to assess his profit and loss situation. He keeps abreast of his accounts and will regularly evaluate his money status. He will constantly have a feel of the overall status of his business, i.e. whether it is declining or succeeding. He can then remedy the situation at an early stage if it is in decline. A businessman, who does not keep track of his progression, does not keep a check of the status of his business. It may be heading for bankruptcy, and it may be too late to remedy the situation by the time he realises his position. Similarly, Lord Swaminarayan says that he who does not assess his status in the devotion of the Lord will not succeed. He must be frank and confess if his devotion is in decline, or merely staying the same. If he recognises this at an early stage, a remedy can be implemented to reverse the situation. Jeevanpran Swamibapa says that this Sadguru Din is the occasion when this self-assessment should be made because all the principle devotional practices are included in the day's observance. And that is why Sadguru Din is held with such great esteem. Jeevanpran Swamibapa says, "Be honest with yourself. Have you increased in devotion since the last Sadguru Din, or remained just the same. Have your attachments to worldly affairs decreased? Whilst in dhyaan, how much were you able to concentrate on the murti of God?" Jeevanpran Swamibapa says that you should pray to the merciful Lord Swaminarayan, that a constant increase occurs, but never a decline. As a finale to the day, a devotional prarthna (prayer) is sung - the Sansmaran (remembrance) kirtan. Jeevanpran Swamibapa wrote this prarthna the day after Sadguru Bapa left his human appearance (on Vikram samvat 1999 ashaad sud 1 - 1942). Jeevanpran Swamibapa performed the ceremonial agnisanskaar vidhi (cremation ceremony) on the murti of Sadguru Bapa and that very afternoon He left Amdavad and returned to Kadi where He was residing at the time. It was new years day and the train was virtually deserted. Jeevanpran Swamibapa sat in the empty carriage in deep meditation, contemplating and reminiscing about the love that He had experienced from His Gurudev Shree Ishwar Bapa. Tears streamed from His netra (divine eyes), and His hoth (divine lips) were muttering a prayer to Sadguru Bapa, which He had spontaneously composed. Jem kaheso tem karsoo, jodi haathaji.